Learn how to grow potatoes and you may end up with a storeroom full of potatoes to last through the fall and winter months. Growing potatoes does not have to be difficult as these plants are highly tolerant to most climates and good growers. As one of the most adaptable types of vegetables to grow, most areas will do well growing potatoes. However, you can do some things to improve the yield of the potato patch you grow by taking a few extra steps. Potatoes grow well in loose soil that drains well. The roots of these plants will root through the area very well. These plants can be very aggressive and will disrupt other plants if they are not contained in some way. Also, if you want a larger crop, be sure to till the soil well so that it is light and filled with air. The best potato crops come from soils that are slightly acidic. Try to balance the pH between 5.8 and 6.5 for the best results. Do rotate the area you grow these crops in. You should use a three-year cycle. This means that every year you switch to a new location for growing potatoes and the previous location should be left potato-free for at least two years. Do provide the potato plants a location where they will get full sun, which is at least six hours of sunlight per day. As you prepare your garden for potatoes, focus on the plants themselves. You can find a wide range of varieties of potatoes available in most local nurseries or at online nursery shops. What you are looking for specifically are called seed potatoes. These potatoes are specifically meant to be used to grow crops rather than to be consumed. Do not plant potatoes until the soil temperature has warmed. Most potato varieties will not grow until the soil reaches at least 45 degrees F.
In most climate zones, you should be able to plant potatoes in early spring, unless you are in a cold weather climate. If the soil is easily manageable, this is a good sign you can plant potatoes. Start with soil that is evenly moist. It should not be soggy or have puddles, but should be just moist to the touch. 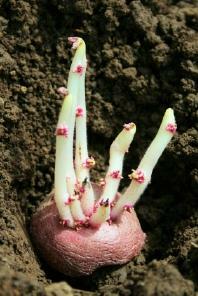 Potatoes will not grow in muddy soil because it is harder for the roots to spread. About one to two weeks prior to planting the potatoes, place them where they can be exposed to some warmth and light. Locate an indoor area that is between 60 and 70 degrees F in the sunlight. This encourages the plants to begin to sprout. The day before planting, use a sharp knife to cut the larger seed potatoes into smaller pieces, which will serve as your seeds. The goal is for each seed to be about two inches square and have at least one, preferably two eyes on them. Eyes, or buds, are the locations where the sprouts are shooting off. Till the soil in the desired planting area. Remove any vegetation and ensure that rocks and harder soils are removed. Plant the potatoes in rows about 15 inches apart. Keep rows at least two feet apart. To do this, dig a trench about four inches wide by six inches deep. Place the seeds cut side down. You will notice sprouts after about two weeks. When they reach this point, add a bit more soil over the top of the plants. Do this again in about two more weeks. This keeps new potatoes from sun exposure, which will cause them to turn green. Keep the soil moist throughout the summer months. Now that you have learned how to grow potatoes, your question is likely when to harvest them. This can be the most difficult aspect. Most often, you can begin to harvest the new potatoes as soon as they reach the desired size, usually about three weeks after they have flowered. To harvest, simply loosen the soil to expose the potato and remove the largest of them. By the beginning of fall, the foliage has likely died back. You can remove this foliage if it is still present to stop the crop from growing. This gives the potatoes time to mature before the winter months. These potatoes can then be stored in a cool, dry place for three to six months.